Cover image: Organizing committee members for the “Be One” celebration sit on the stand in the LDS Conference Center in Salt Lake City on Friday, June 1, 2018. 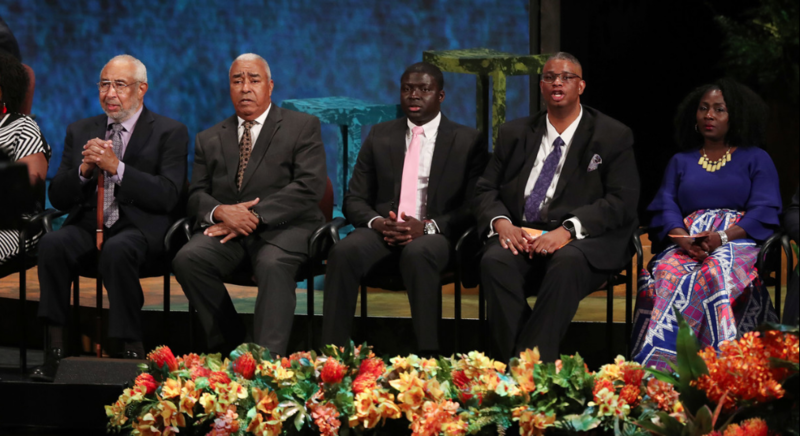 The event celebrated the 40th anniversary of the 1978 revelation on the priesthood. Darius Gray spent the past eight months reviewing racist statements made in the past by LDS Church members and late church leaders in preparation for the major lecture he gave Friday night at the Salt Lake City Library. The project of looking backward to talk about his 54 years as a black member of The Church of Jesus Christ of Latter-day Saints stirred up fresh pain he didn’t expect. A month ago, Gray, looked up to by thousands of African-American Mormons for what one observer called his wise and measured voice, found himself unable to complete his talk, even as he helped organize the 40th-anniversary celebration of the revelation that ended the church’s restriction on blacks holding the priesthood. His unexpected burden finally lifted on June 1 as he sat on the stand in the Conference Center with every member of the church’s First Presidency and Quorum of the Twelve during “Be One,” the First Presidency’s celebration of the revelation. Gray characterized the event as marvelous. “I harbor magnificent hopes for our future,” he said.